Guado (Isatis Tinctoria) is a Cruciferae family’s herb that existes in Europe since prehistory (Neolithic), then in Ancient Egypt till the guado’s cultivation and its transformation to get the powder dye. Throughout the Middle Ages and the Renaissance it formed the primary economic resource of many territories in Europe. Its manufacturing process was the same until the seventeenth century : the manual harvesting of leaves, the techniques of grinding and drying of the product through the method of “cocagnes” (guado’s balls from which the famous common saying the “land of plenty”, the country’s wealth derived from the sale of the final product) and fermentation followed in different countries and similar time phases. Guado’s trade in Europe was so important that, from thirteenth century it was regulated throughout its chain to control the quality of production. 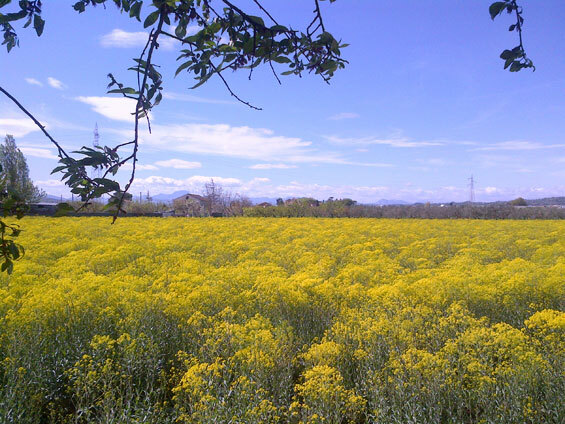 In these centuries the cultivation and trade of Guado are documented in Umbria , as well as in Marche and Tuscany. For this quality pigment’s trade, the position of these areas was strategic to supply the dyein industries of Florence, Tuscany and Venice. In the Codex Atlanticus Leonardo shows the recipe “for making indigo” and get the different tints; he regulates the preparation of the dye, without getting too lost in the details: generically called indigo what it actually corresponds to is indigo from woad. The turquoise blue that is obtained from his recipe was used later in his paintings. The proceeds from the blue woad are the basis and inspiration colour of many paintings by Piero della Francesca, whose father was a wealthy woad merchant of St. Sepulchre. The colour woad was used by dyers for colouring wool and silks used for large Renaissance tapestries. In fact, many medieval tapestries which have come down to us, such as the Bayeux Tapestry or the tapestry of the Apocalypse are dyed in woad. The colour, which has passed through the centuries has remained unchanged, demonstrating its extraordinary strength. The fortune of woad began to decline with the introduction of Indigo in the European market at the hands of Arab merchants in 1600. Compared to woad, indigo had the advantage of having a method of extraction of the pigment easier and cheaper and because of that, in very short time, replaced woad in the production of the blue pigment. Around 1810, to circumvent the difficulties of supply due to continental blockage of indigo by the English against Napoleon, the culture of woad was again reintroduced, especially in France, but there was almost time to rebuild the cycle of the supply chain for the production of pigment (it had already been lost in memory), then indigo retraced "markets". 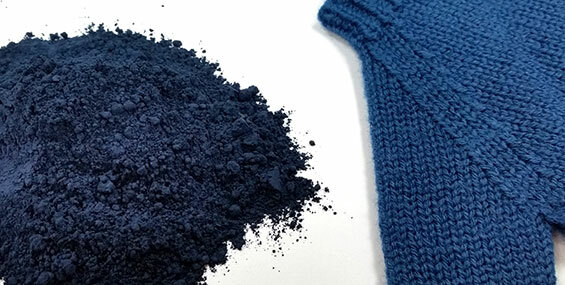 From the recovery of historical information and for the many environmental reasons close to our culture of business, we wanted to experience a new coloring technology for textile fibers with the use of blue woad. 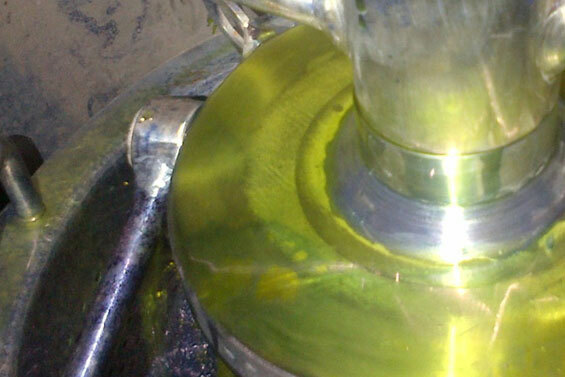 This important effort has been possible thanks to the partnership with Cariaggi who believed and supported the project of research and development for the construction of a specific chain; from agricultural production of blue woad, through to extraction of the pigment, until the application of the product on the textile fibers that at present we compete. The colour can be used to dye staple, yarn or pieces of clothing and is made exclusively from the collection of the leaf of the plant cultivated through specific and exclusive agreements with the agricultural production cooperative Oasicolori. The woad is treated with the necessary care, which preserves a natural product, collected, manipulated for the extraction of the pigment, dried and ground before being used in the dyeing process that runs through long Ferrini dye baths. The quality craftsmanship reached, the uniqueness and beauty of the colour blue woad, characterizes this process that ennobles the treated material and distinguishes this original, authentic and exclusive product offering a know-how that Ferrini offers to its customers and partners.